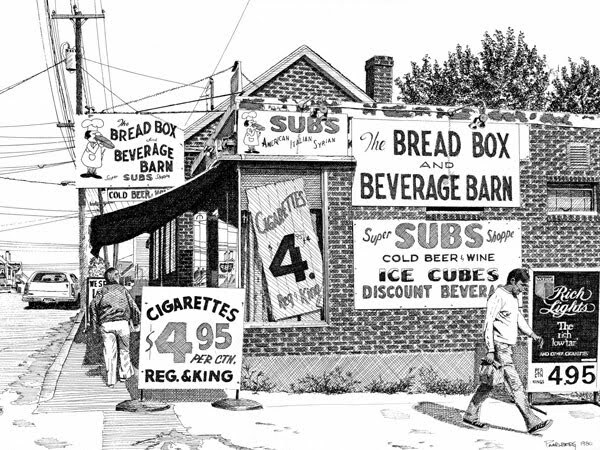 The Bread Box and Beverage Barn is still on Islington Street in Portsmouth, but now it is more like a sub shop or cafe. Back in 1980 when I drew this pen and ink view from the parking lot the interior was jammed with cases of beer, and you had to kind of squeeze your way around. I just loved the graphic assault of all those signs. I sold the original to Bruce and Carol Marshall, the owners at the time. Duff’s Dump was the cafe across the street. I only went in there once, when I was tending for mason Steven Lee and he bought lunch. Yeah, it was pretty much a dump. This is great! I remember having to squeeze around all those stacked up cases of beer! My question: Are you sure Duff’s Dump was across the street from there? I know it was on Islington, but don’t remember it being that far down the street…I used to go there sometimes from the Ranger Club, and that would have been quite a hike. Yes, indeed, Ellen, the inside was just as cluttered as the outside. I only ate a Duff’s Dump once, and I am pretty sure it was, yes, more or less across from The Bread Box, down at that end of Islington. The building is still there, one door and one window facing the street.